Apparently there are some people in this world who don’t like fruit with their fish. Thankfully, I don’t know any of them. If you happen to be a fruit with fish hater (tear), perhaps this recipe will convert you. Especially with summer “officially” here, this is a refreshing dinner that is easy to throw together after a day at the pool, and won’t ruin your waistline for the rest of bikini season. I was somewhat hesitant about the sauce, since it’s fruit combined with garlic, onion and mustard powder – but I figured anything originally from The Neely’s would be hard to ruin. Somehow the flavors just seem to work, and created an interesting twist on a simple salmon recipe. I personally like to keep the skin on the salmon it because it keeps it in one piece while grilling and adds moisture to the filet, but you could also grill up a fish filet as long as you throughly oil the grate. While the sauce is mostly “hands off”, it does need about 30 minutes total of simmer time – which I kind of enjoy because it gives you a chance to shower from the pool, pick up the house, or just relax with a glass of wine on the patio. Unfortunately my brother won’t be bringing any Copper River salmon back from Alaska this year, but if your pocketbook can afford it, it’s in season now! Heat a small saucepan over low heat and add blueberries. Heat for about 10 minutes, then mash with a fork. Add in ketchup, both vinegars, brown sugar, onion and garlic powder, ground mustard and worcestershire sauce. Whisk well to combine and break up blueberries and turn the heat up to medium. Heat until simmering and bubbles appear, then turn heat back down to low. Cook for an additional 20 minutes, whisking every few minutes. Sauce will be thicker than a normal barbecue sauce. This entry was posted on June 3, 2012 by Spice Is Nice. It was filed under Easy Weeknight Dinners, Fish, Main Dish and was tagged with bbq, Blueberries, Salmon, seafood. 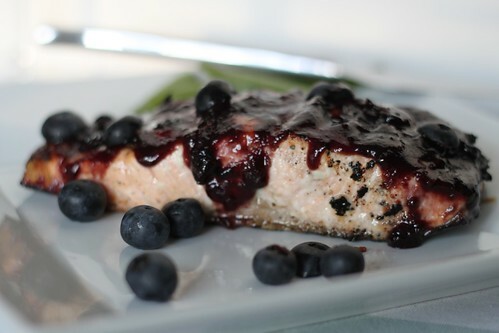 After the delicious strawberry pizza – I am not at all skeptical of blueberry salmon! I will definitely try this soon!! Thanks for the recipe! !